The SanDisk Sansa Fuze is a portable MP3 player. It is a direct competitor of the Apple iPod, and it sells for around $150. This product comes with its own software the Sansa Media Converter. The Sansa Fuze media converter software program allows you to convert media into files supported by your MP3 device. With so many other types of video and photo formats, this list looks very limiting. The Sansa Media Converter PC program allows you to convert a variety of different file formats into formats actually supported by the device. The interface is fairly simple to use. You simply open up the program, and press the Add Media button to add the file that you need converted. You then just select Convert to convert the file. You can preview the file by clicking on the Preview screen, which is located in the lower left-hand corner. While the interface if fairly straightforward, it also limits what you can do with your media, especially videos. You can’t see the size of the video, and you can’t adjust the quality output options. If you have videos in these formats, you will have to purchase a different type of video conversion program, which means spending more money. If you do have to get another program, first look for other free programs that can convert your file format. Or, download a trial version of a program so that you get an idea of how it works. The conversions play fine on the Fuze, and photos and videos still look good even after major compression. There’s no issue with overall quality of the images and videos. The major problem with this software is that it’s not bundled with the device. Instead, you have to download the software from either SanDisk or third-party sites. It would have been easier to make this a part of package. If you need to download the software, go to the SanDisk website, and download the Sansa Firmware Updater. This is the only way to get the Sansa Media Converter application. Plug your Sansa player into your computer, and the program should automatically start. Go to your Start menu, and select Programs. Scroll down to the SanDisk folder, and select the Sansa Updater. Click on Sansa Updater. The program will now install on your computer. After the Sansa Updater installs, open it up, and find the Sansa Media Converter in this list of Available Downloads. Click on the box next to it, and select Download Now. When the program is done installing, select Finish. Go to Programs and then SanDisk. 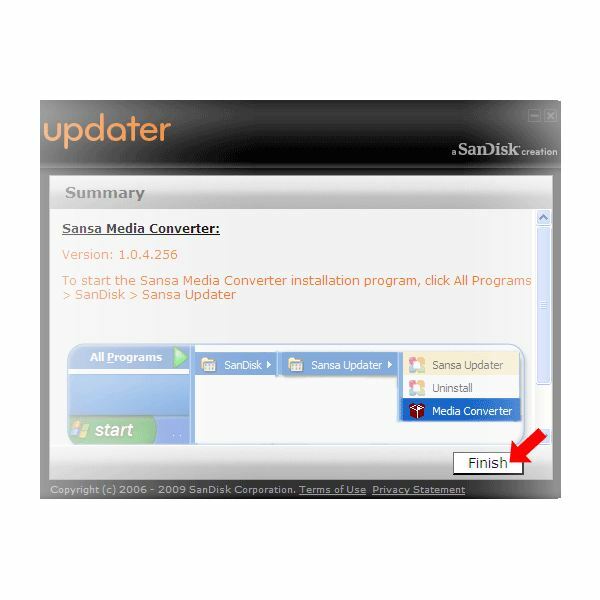 Go into Sansa Updater, and select Sansa Media Converter. While these steps are relatively easy to follow, non-technical users may not know enough about their computers to go through all of these steps. Plus, they may not even know that they have to download the software from Sansa. Overall, the Sansa Fuze Media Converter software program works, but it does have its drawbacks. You can’t convert all types of files, especially extremely popular formats. The program isn’t bundled with the Fuze player, which means that you have to download it from Sansa or third-party sites. The setup of the program can be confusing for non-technical people. On the other hand, most people are only going to convert a handful of photos and videos, and the formats that most people use are supported by the device. The Media Converter program is free, and it eliminates the need of purchasing an external converter. While not perfect, this program is usable and does do the job. The Sansa Fuze MP3 player is a budget device so it makes sense that it has budget software. You pretty much get what you pay for when it comes to the software program. The problems, however, are not a deal breaker for the device. You may not even use the Media Converter that often. France, Jasmine. “SanDisk Sansa Fuze (8GB, silver)”.